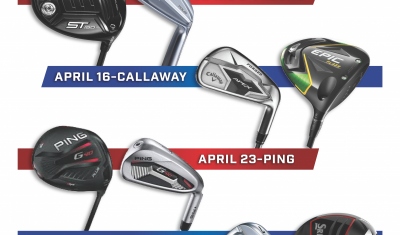 Chuck has assembled state-of-the-art hardware, software and cameras that are used to provide a unique golf instructional experience. The students have the opportunity to review their complete golf swings on the monitors and compare them to the swings of accomplished players. Working with Chuck has been the best choice I could have made for my golf game. He is an excellent teacher and a great friend. I look forward to having him as my coach for years to come. Best golf instruction I've ever had. Chuck was able to quickly focus on my swing problems and give me corrections that worked...took 10 strokes off my average round. Your ability to help me correct the things I was doing wrong in my swing was remarkable. Thanks for making golf fun again! Chuck has lifted my game to a new level and shaved 10 strokes off my handicap and I thank you! A true teaching pro and master of swing diagnostics. Excellent facilities complement the lessons. Golf is fun again! 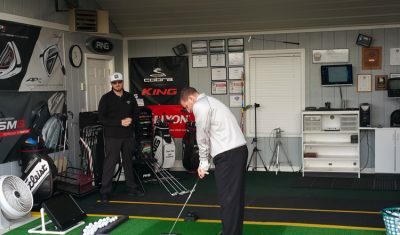 Chuck's video based training allowed him to communicate existing problems in my swing quickly and effectively. From that point, the corrections were easy to point out and incorporate. That translated into some very positive results in just a few lessons. It's easy to see that Chuck has experience and talent in teaching others the game. Getting to the point of enjoying the game is what it's all about. Sure, you're going to regress a little when you start, but when you get tired of hitting bad shots, he's got good stories to tell. Chuck is able to quickly and clearly detect the student's fault(s) and then offer up just as quickly the solution(s) to fix the fault(s) - Not an easy thing to do. Chuck gave me the one or two swing keys that have really improved my game. I recommend him highly! Chuck knows how to teach golf (and even makes it fun). With a combination of outdoor sessions to see how the ball really flies and indoor sessions to see how the computer judges your swing. Chuck has improved my game! His sense of humor, wit and common sense approach to teaching puts Chuck head and shoulders above other instructors I have had. 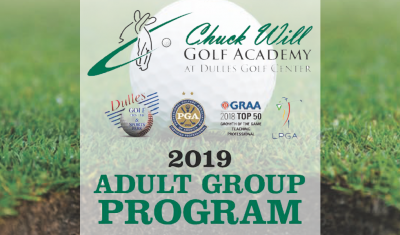 Would recommend Chuck or any of his staff at the "Chuck Will Golf Academy" if you are looking to improve and learn more about the game of golf. I have seen great progress after I attended your program. Also, my golf game is continuing to improve!